According to the latest reports, the last days have given us the first information about a possible variant of the latest flagship of the well-known Chinese smartphone manufacturer, of course, OnePlus’, OnePlus 7, known as OnePlus 7 Pro. It seems that little by little we are getting more details about its design, and now thanks to a poster through which we have now also known what its main characteristic would be according to the well-known Chinese smartphone manufacturer OnePlus itself. The last days have given us the first information about a possible variant of the latest flagship of the well-known Chinese smartphone manufacturer, of course, OnePlus’, OnePlus 7, known as OnePlus 7 Pro. It seems that little by little we are getting more details about its design, and now thanks to a poster through which we have now also known what its main characteristic would be according to the well-known Chinese smartphone manufacturer OnePlus itself. As we said, the design seems one of the most important aspects of this new OnePlus 7 Pro, and certainly, it seems that one of the highlights will undoubtedly the screen and the camera of the device. While the latter one would be the retractable camera, as we already saw in the Vivo Nex and Oppo Find X. Now we all know very well that there will be several versions of the OnePlus 7, but, one of the big questions come here that how all the variants will be different from the OnePlus 7 standard model. As in other smartphones, we have seen how the Plus or Pro model has a better camera. 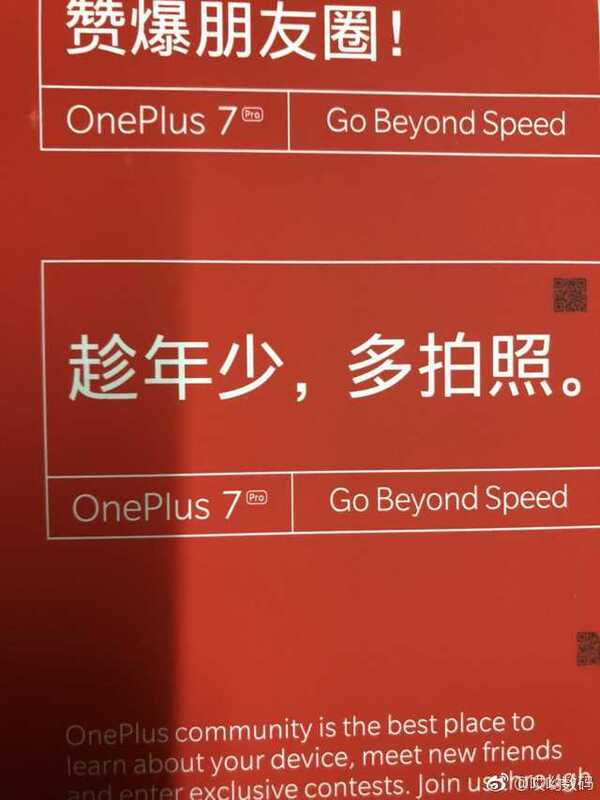 In the case of an alleged OnePlus 7 Pro poster, we have seen that the device, according to the well-known flagship maker OnePlus will “Go beyond speed”, it is the message that OnePlus itself would have chosen for this model. However, here, the question is what does the well-known flagship maker OnePlus mean by the message of “Go beyond speed”, if we consider that both the OnePlus 6 and the OnePlus 6T marketing message was quite also similar. No doubt what comes to mind, in this case, is that it is the 5G version of OnePlus 7, a model that is expected as in the rest of the range of 2019. It would be a good reason why This way, it owns the OnePlus 7 Pro, since it would become the fastest OnePlus, as far as networks are concerned. The other messages that are seen in Chinese would be a kind of joke or joke about the camera, which seems that it would also be one of the highlights of the OnePlus 7 Pro. In fact, the front camera would be hidden under the body of the device itself. So we can expect a design more similar to the Vivo Nex, without any notch or strange shape inside the screen, even a hole. Another image of this same poster, to which we do not give much reliability speaks about the May 14, as it could be the date chosen by OnePlus itself to present its brand new OnePlus 7 Pro. So, what do you think about this? Simply share all your views and thoughts in the comment section below. And if you liked this post then simply do not forget to share this post with your friends and family.